Levapan produces and sales bread yeast and other raw material for the food industry. With a tradition of more than 60 years, the brand is now on Latam & South America. With the aim of adding value to the colombian bread industry, Levapan starts an inbound strategy for its virtual magazine Pan Caliente and its foody blog. Through different e-books, the brand gets high qualified subscribers using as a main channel Facebook Lead Generation. As for the strategy, everything was absolutely well planned and detailed. 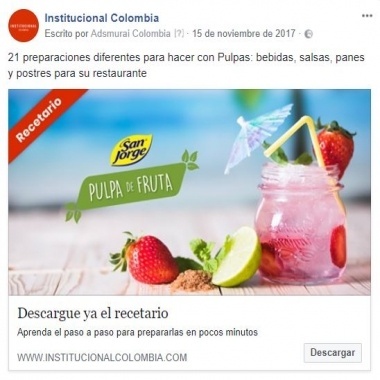 The main challenge of the campaign was to target it to a high qualified audience to reach “chefs” as professional profile: we used Custom Audiences, Lookalikes, users who interacted with Facebook Page... And, at the same time, some other professional profiles and interests were excluded from our focus such as “housekeepers”. In terms of ads, we invested in single image & carousel formats so we could optimise them. All the copywritings were action oriented and clearly targeted to the right audience. For example: “Download the recipe book for your restaurant.” About the form, it was very easy and simple. With no extra pages. There were only one open question, one selector and two more personal but prefilled questions. Therefore, we avoided users to leave the funnel before ending it. We finally achieved a super high CTR% of 6,7%; and also a remarkable LTR% (Lead through rate) of 43%. We compared these good results vs the last Lead Generation campaign and, we could add that: we decreased the avg. cost per lead on 74% and we generated 55% more subscribers than last time. An exceptional results for the whole campaign. One of the most satisfying things whilst working with Adsmurai was the ability to rely on a team that supports you from the start, middle and end of the process. A team that is not willing to conform, but instead is very detail-oriented at the time of managing and executing the campaigns.